"I got this recipe and it wasn't low carb and included breadcrumbs instead of Parmesan cheese so you could form patties (like a latke). Since I'm living a low-carb lifestyle, I decided to adapt it, but the patties were less-than-desirable visually the taste wasn't that impressive. I had one completely fall apart on me in the pan so I just scrambled it up and viola; we had a new fave! You can add bacon and garlic as a yummy addition, if desired." Place cauliflower into a large pot and cover with water; bring to a boil. Reduce heat to medium-low and simmer until tender, 7 to 10 minutes. Drain. Mash cauliflower in a bowl until smooth. 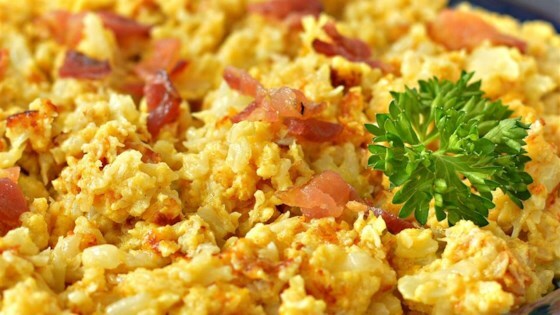 Beat Cheddar cheese, Parmesan cheese, eggs, cayenne pepper, and salt into cauliflower. Melt butter in a skillet over medium-high heat. Pour cauliflower mixture into hot butter and cook until golden, about 5 minutes. Flip cauliflower mixture; cook and stir until mixture is more crumbly than creamy, about 10 minutes more. A perfect breakfast dish for those watching their carbs. This would also be great with the addition of diced onion and green pepper. I added crumbled bacon on top. My husband loves this! I add chicken (2 large breasts) that I sautéed in 3tsp soy sauce and 2tsp Chinese 5 spice. Amazing low carb healthy recipe! Great recipe! If using Parmesan go easy on the salt or skip it all together. Also, allow longer cooking time I the skillet to get it to have a hash brown type texture. Great side dish! This was delicious and very easy to make. Will definitely make again. Very good. I wasn't really sure if my family would like this but they all had seconds with no leftovers! I made it according to instructions and it was great. Low carb and tasty.